For the default setup host machine needs at least 4GB of memory and the VMware instance needs at least 2GB of memory. To run the all services once, the host machine needs at least 8GB of memory and the VMware instance needs 6GB of memory. At least 6GB of hard disk space. It's easy and it's safer. It's a place where you can make mistakes, corrupt your database or crash your operating system. You might want to work in your favorite operating system and still needs testing in other platforms. People wants to get their hands on new products without the fear and hesitancy of harming their PCs. For all of these, a virtual machine is the ideal place. A virtual machine is like a physical computer which contains its own software based virtual hardware. (hard disk, CPU, network interface, etc). Even though you can run multiple virtual machines in a single PC they are completely isolated from each other. A virtual machine is portable and easy to manage, you can copy or move a virtual machine from one place to another like any other file. Configuring the product is another barrier for most of the people. Reading long installation guides and going through the installation and configuration process is time consuming and you tend to give up at some point. WSO2 Stratos VMware image is preinstalled and preconfigured. You just have to boot it and play with it. Unzip the VMware image. If you're using the VMware server you have to unzip the image in to your VMware image store. It's /var/lib/vmware/Virtual Machines in Linux and C:\Virtual Machines in Windows by default. Here I used VMware player for the demonstratoin. 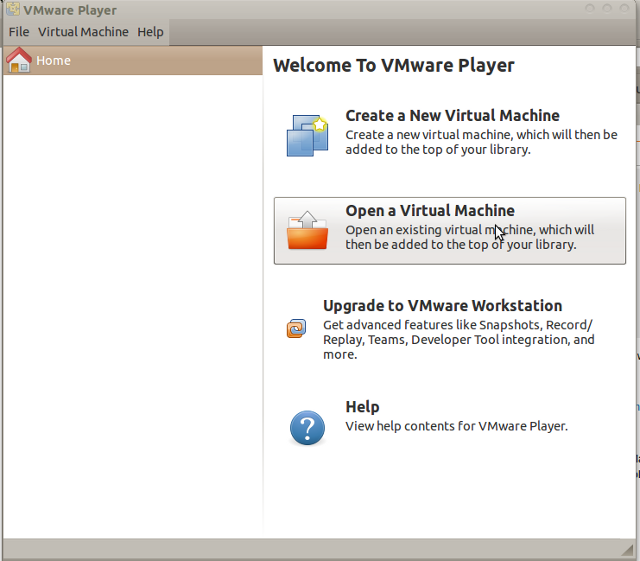 Start the VMware player and select the "Open a Virtual Machine" option in VMware player main window. 4. 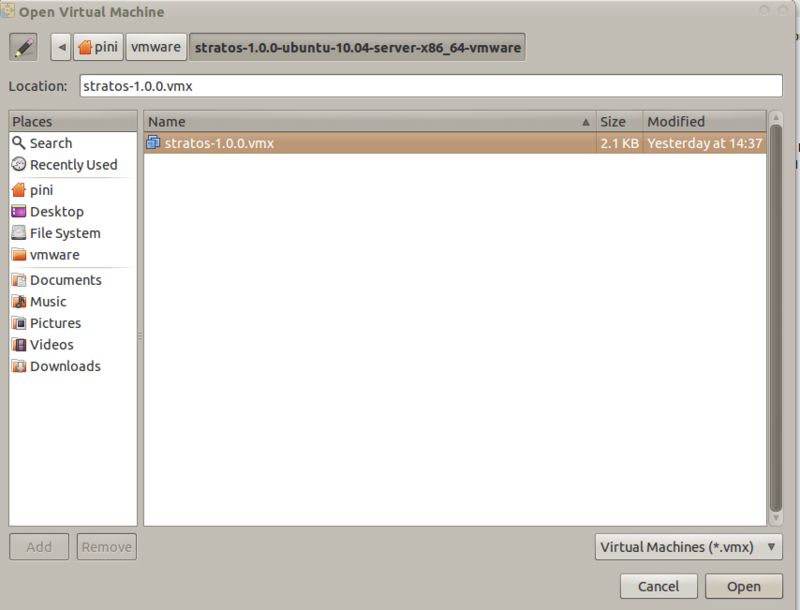 Select the stratos-1.0.0.vmx inside the unzipped directory. 5. 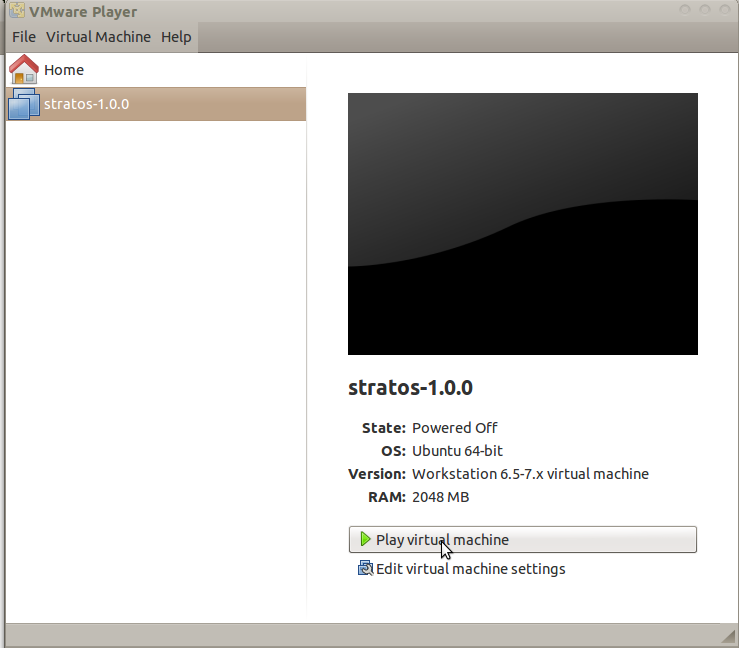 A virtual machine named stratos-1.0.0 will appear in your inventory. Click "Play virtual machine" to start it. 6. While startup it'll ask whether the image is copied or moved. Please select "I moved it". All services are configured in this Virtual Machine. By default it will start WSO2 Stratos manager, Stratos Identity, Stratos Governance, Stratos Business Activity Monitor and Stratos Application Server at the machine startup. It takes around 40-70 seconds to start a service depending on the performance of your machine. Therefore it will take around five minutes to start those services after booting up the machine. You can start|stop any of the services using following commands. 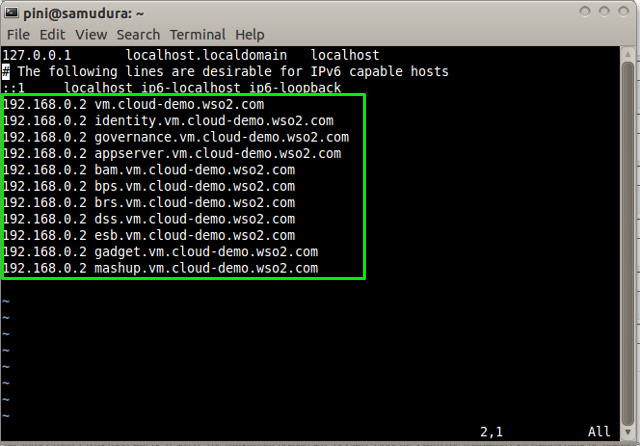 Then to access the management console go to https://vm.cloud-demo.wso2.com in Virtual Machine's browser. It's the firefox home page of the virtual machine by default. If you want to access the management console outside the host you have to do the following change in the guest machine. Findout the IP of the VMware host. Here my IP is 192.168.0.2. Add following entry to the /etc/hosts file in the guest machine. If the file is not empty add it after the existing content. You might need root permission for this operation. In the guest go to the following URL in the browser to access the management colsole. 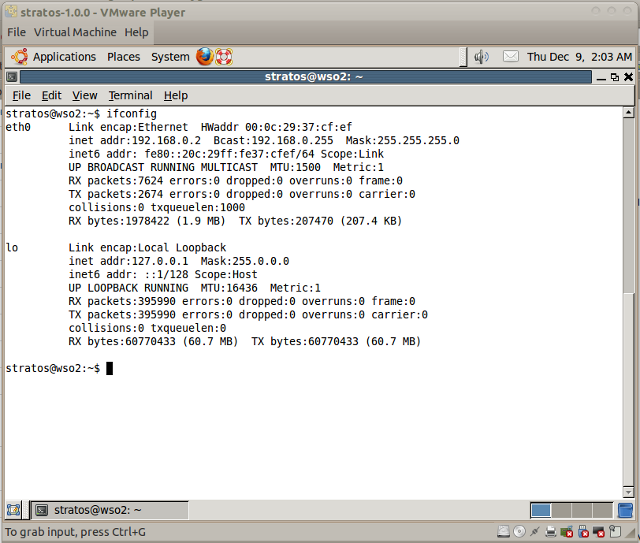 VMware instance runs on Ubuntu Server 10.04 64 bit. This image is tested with VMware Player 3.1.3 build-324285. WSO2 Stratos VMware image enables everyone to tryout the complete Stratos platform without going through the installation and configuration process. This gives anyone a chance to hands on it with minimal effort and minimal wastage of time. Author: Sanjaya Ratnaweera, Senior Software Engineer, WSO2 Inc.